Our unique technology offers an unconventional solution on conveying: focus on handling material instead of moving heavy feeding trays. A less weighted tray contributes to more effective conveying of the goods. Regarding 16 kg resp. 8 kg and 4 kg attached weights of our conveyors (the summed weight of feeding trays, bars, fasteners etc. 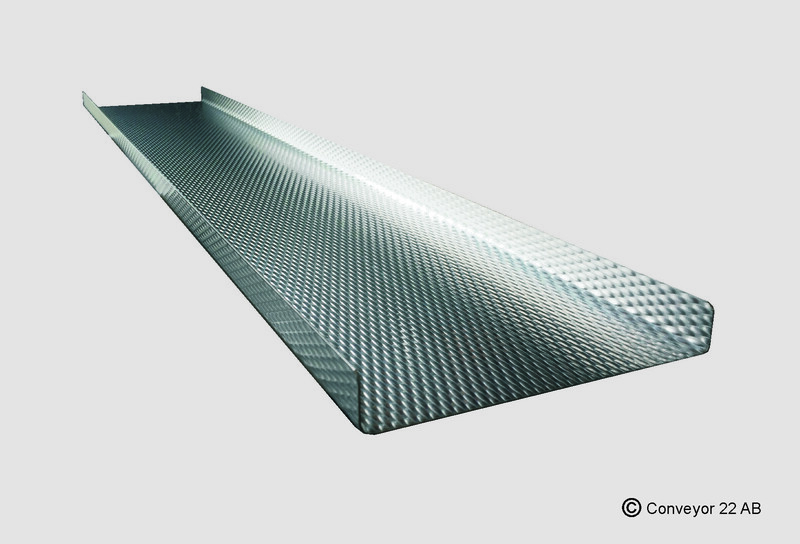 ), we recommend max 1 mm material thickness for feeding tray. 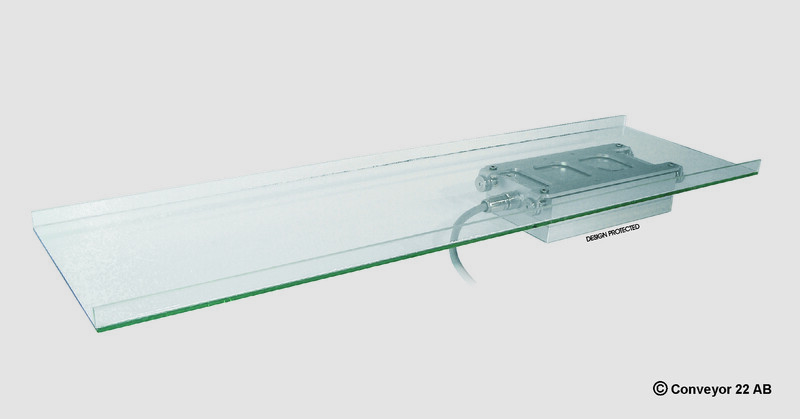 Our linear motion eliminates the risk on exposing feeding tray material to stress by vibrations. Extra stability can be provided by using sliding elements. 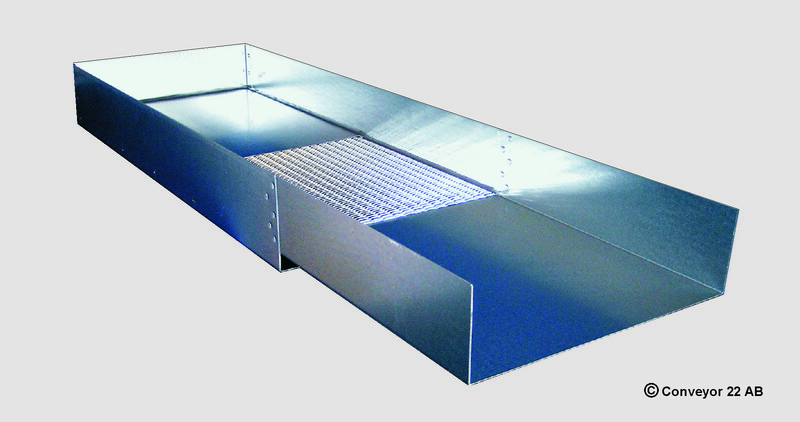 We provide ready-to-use standard feeding trays in required length and width. 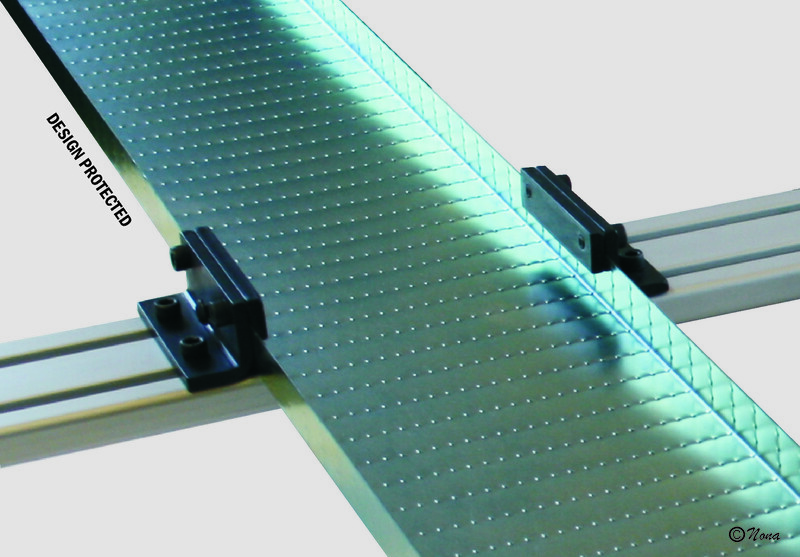 The single trays are mounted upon the conveyor with supplied fasteners. RC22 is the optimal transport plate designed by Conveyor 22. 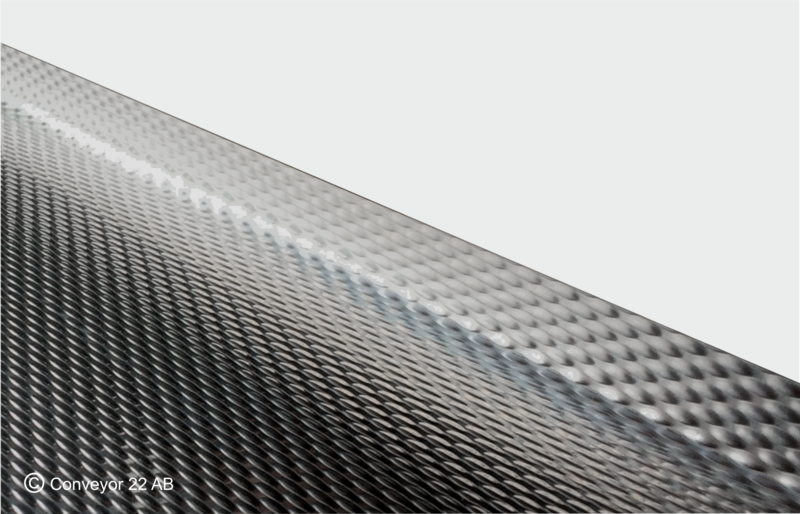 Reduced friction against the contact surface increases transport speed and effectively eliminates the sticking of oily parts. 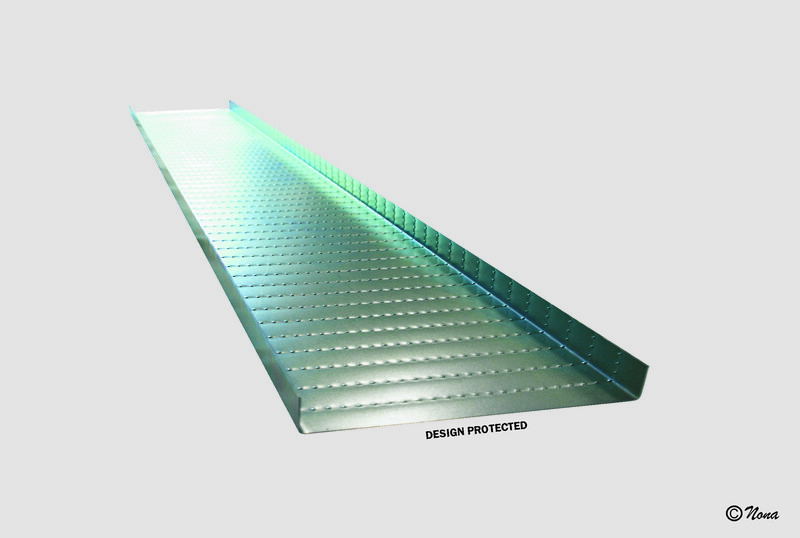 The perforated plate is durable and the surface is electroplated. 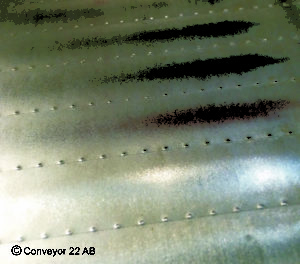 RC22 is also available in stainless steel. 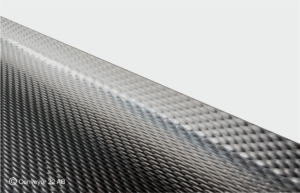 Even after two years of production, the reduced friction of the RC22 conserves original performance, and full efficiency is maintained. 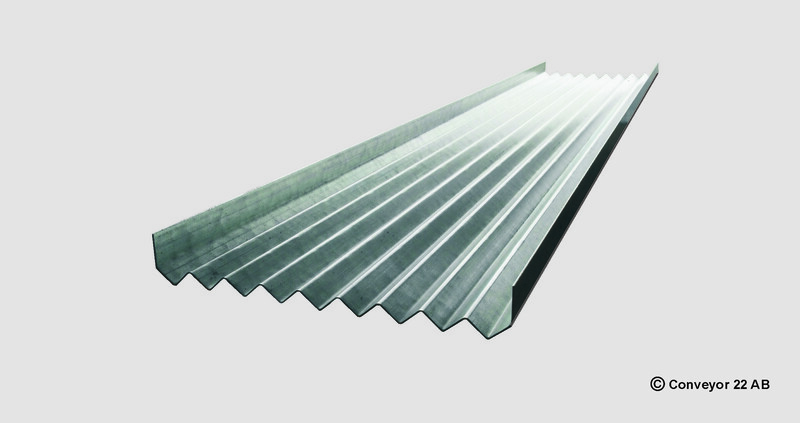 AN5 is a pattern rolled plate and a good alternative to the RC22. The plate has a slightly textured surface, is durable and the material is stainless steel. The tray fasteners are made of high strength steel and are easily adjustable in X and Y dimensions. 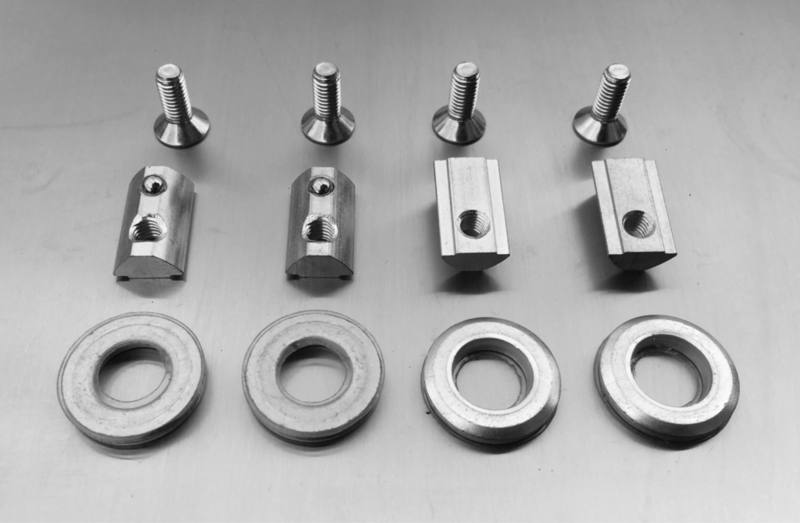 The tray fasteners are delivered in pairs with clamping bolts in 10.9 DIN-quality and special T-slot-nuts designed for our aluminium bars. The inverted tray fasteners are made of high strength steel and are easily adjusted in both X and Y axis. They are delivered in pairs assorted with clamping bolts in 10.9 DIN-quality and special T-slot-nuts designed for our aluminium bars. 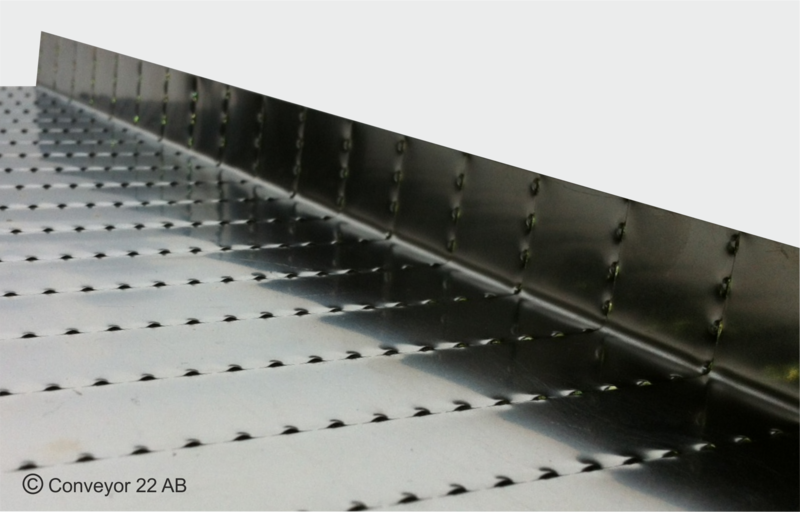 The inverted tray fasteners allow installation of the conveyor on the same horizontal level as the feeding trays or turned 180 degrees for feeding trays with 40 mm high edge. 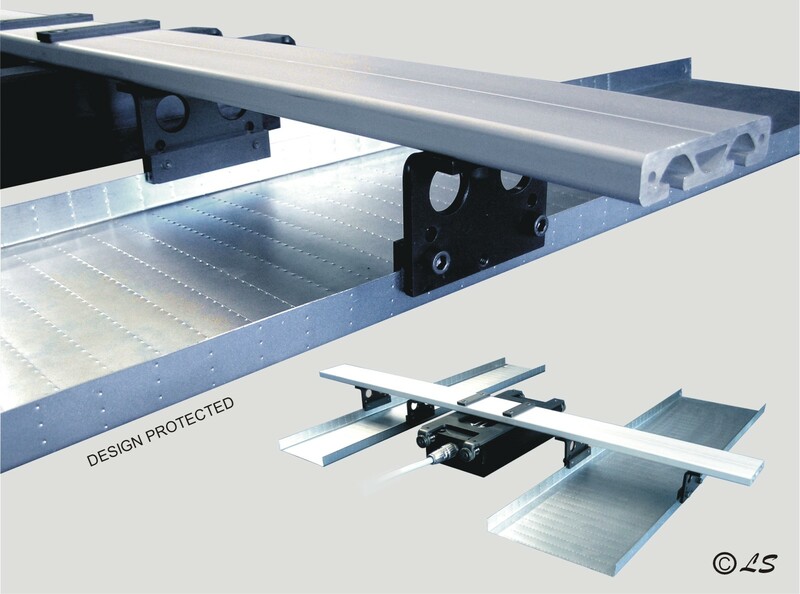 The supporting part is mounted into a machine/tool to provide extra stability to the feeding tray, ensures that the tray is in line with the conveyor as well as minimize the friction and noise. Sliding parts are made to fit feeding trays width and made of high-molecular polyethylene with excellent sliding properties and wear resistance. Mounting is easy with the included stainless steel screws. 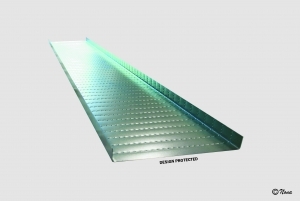 The supporting part is mounted underneath the feeding tray to provide extra stability, ensures that the tray is in line with the conveyor as well as minimize the friction and noise. 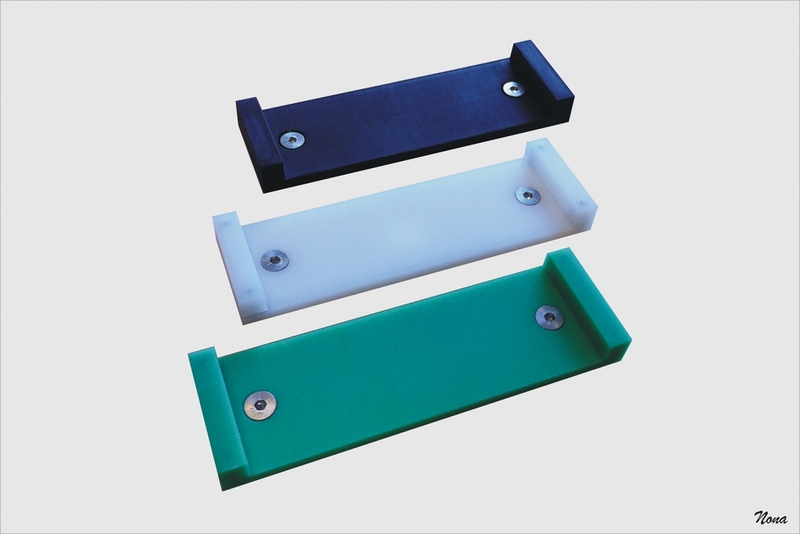 Sliding parts are made to fit feeding trays width and made of high-molecular polyethylene with pre-mounted insert nuts. The holes are to be drilled in the tray, and mounting of the sliding part is easy with the supplied hex screws. Tray fastener T-Slot is a kit for mounting feeding trays directly against our aluminum bar. The kit makes the tray fully adjustable in X axis. The kit consists of 4 screws, 4 washers with self-adhesive metal tape and 4 T-slot nuts with spring loaded ball. 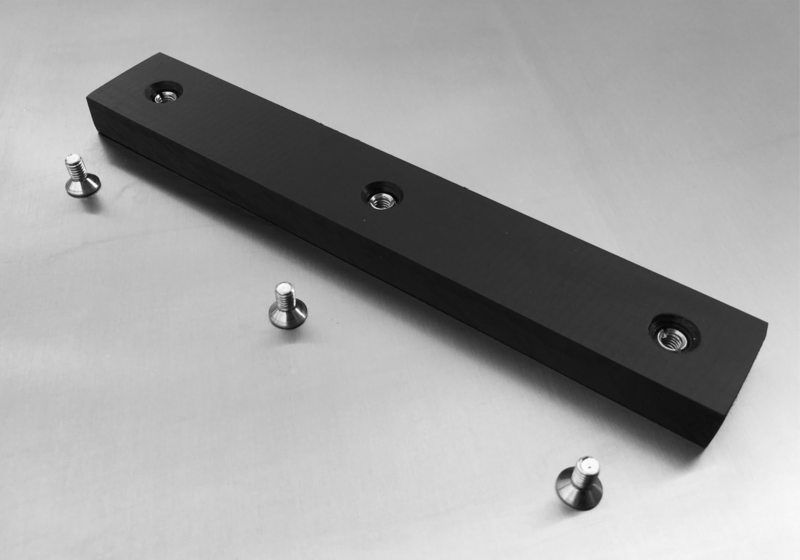 Holes are to be drilled in the feeding tray, then the tray is easily mounted on top of the aluminum bar in suitable position with 4 hex screws. 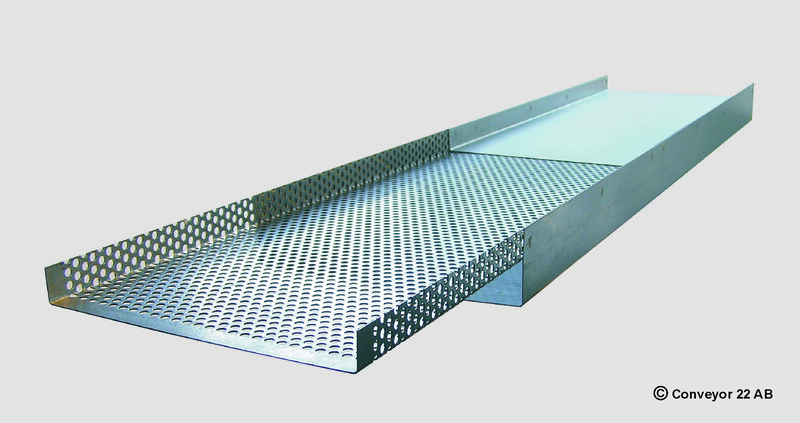 Nylon Spacer stabilises the feeding tray and spreads the load when wide single tray is used with the aluminium bar and tray fasteners. Inclination of the feeding tray can be adjusted using different heights of Nylon Spacer. 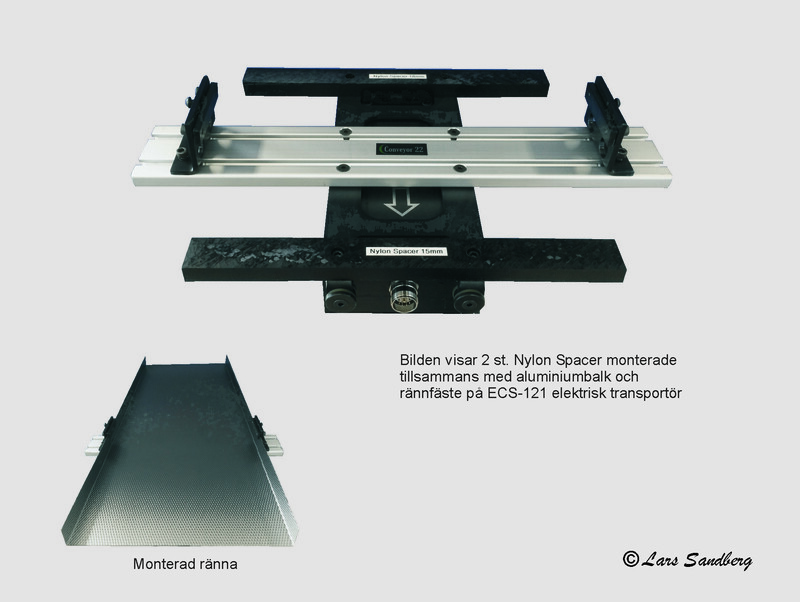 Nylon Spacer has pre-drilled holes and can be easily mounted directly on the conveyor with the supplied bolts.